A trash hauler sentenced in 2008 to more than seven years in prison for a price-fixing conspiracy is accusing federal authorities of violating his plea agreement by failing to pay him more than $3 million after the government took over and sold his companies. The government was supposed to pay James Galante $10.7 million, but has only paid $7.6 million, according to court papers filed by his attorney Friday that seek the balance, interest and legal fees. Galante had agreed in plea negotiations to give up his right to the repayment of about $30 million of the $41 million in outstanding personal loans he had made to the companies, his attorney said. His attorney, H. James Pickerstein, accuses the government of mismanaging what he called the largest forfeiture in the history of Connecticut law enforcement. He said the government took over companies worth about $100 million and sold them for $23 million. Prosecutors will respond in court, said Tom Carson, spokesman for the U.S. Attorney's office. Officials have cited various expenses related to the sale of the companies including environmental work, according to Pickerstein's filing. "Repeated efforts for the past three years to obtain the balance of the funds due has not resulted in full payment, with the government advancing one excuse after another," Pickerstein wrote. 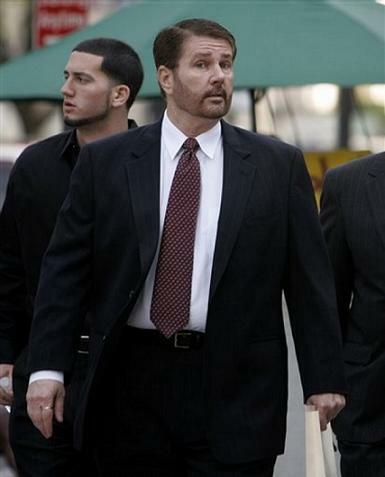 Galante, who pleaded guilty to racketeering conspiracy and fraud charges, has five months left to serve in prison. Galante's businesses handled nearly 80 percent of the refuse in southwestern Connecticut and prosecutors said Galante paid a quarterly $30,000 mob tax to alleged Genovese crime family boss Matthew "Matty the Horse" Ianniello in exchange for muscle to stifle competition. Ianniello pleaded guilty to racketeering conspiracy and tax evasion and was sentenced to two years in prison. He died in August 2012. Galante admitted to trying to rig a bid for a contract to operate a transfer station, tampering with a witness, having no-show employees, accepting payroll kickbacks from employees, and skimming cash from his businesses. He also admitted to violating the salary cap on his minor league hockey team, the Danbury Trashers, after prosecutors said he gave some of the players and their wives no-show jobs with his garbage companies. The witness tampering Galante admitted to involved directions to lie to the grand jury about providing cash on behalf of Galante and others to Ianniello's alleged bag man.